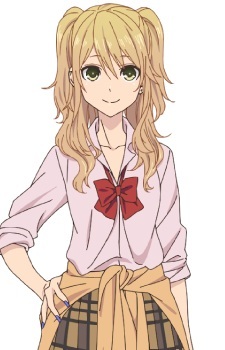 Yuzu is a self-proclaimed gyaru and is the story’s protagonist and Mei Aihara’s older step-sister. Her father died when she was very young. She dyes her hair blonde, and has green eyes. She is a daring, outspoken, and often shameless only child who transfers to an all-girls school (Aihara Girls Academy) after her mother gets remarried. She enjoys dressing up, wearing makeup and customizing her school uniform in ways that clash with her school’s code of conduct, often leading to altercations with the student council. Although her former friends believed her to be quite experienced in dating and relationships, she confesses she has never had a boyfriend. Although she appears quite ditzy at times, with hard work she is able to achieve test results within the school’s top 100, to Himeko’s surprise.